I guess sharing nostalgia depends on how old you are. Don't know if the subject will have any interest, so will let it die if there is none. Anyway... hardly a day goes by, but that something tweaks the memory of "things" from the past. Yesterday I watched an old movie, with WWII soldiers in foxholes, and was reminded of the 1940's when I built a "razor blade foxhole radio" that used the bedspring as an antenna, and the steam radiator as a ground. So, one thing led to another, and I remembered "The Boy Mechanic", an old book my grandmother gave me when I was 7 or 8 years old. It had hundreds of pages of things that a kid could make or do... having to do with mechanics, electronics (sic.) and making things like soap box racers. When I looked it up online, I found it is in the public domain, and free to download. For guys, especially, this might be a fun thing to look at. It represented technology for kids, 100 years ago. So, do you have anything from anytime in your "distant" past that was/is particularly interesting to you? My older siblings were into the Boy Mechanic. Me, only a little, though I loved my erector set. I've tried to interest my grandson in this kind of DIY stuff, but he has his Ipod Touch and cell phone and that is enough at age 11. I made a "crystal set" with a razor blade when I was about 10 or 12. I briefly taught 8th grade science about 40 years ago. I had the kids assemble one of those but using a crystal diode as the detector. They were blown away that something they assembled in class could actually bring in radio stations. I actually made that ice boat in the first few pages! Tried a few of the other things in there too, but one day I must've misread the directions.......I nearly blew the house up! Really. Almost killed myself in the process. All I remember was coming-to and finding fire all around me; mom came down the cellar and put it out. That was the end of my 'experiments' with Boy Mechanic. Thanks for that link to the Boy Mechanic book. That's an eye opener. Many of the bigger projects are pretty ambitious, and I'm sure a youth would need assistance in doing them, but the readers obviously bought the magazine/book because the idea of doing them was appealing. Yep, lots of hazardous stuff that could hurt you (the small skiff is sealed with lead painted on, etc). And some of the stuff would have been hard to obtain for kids then or now. But many of these projects could be easily adapted to readily available supplies (PVC pipe alone would offer a lot of possibilities). 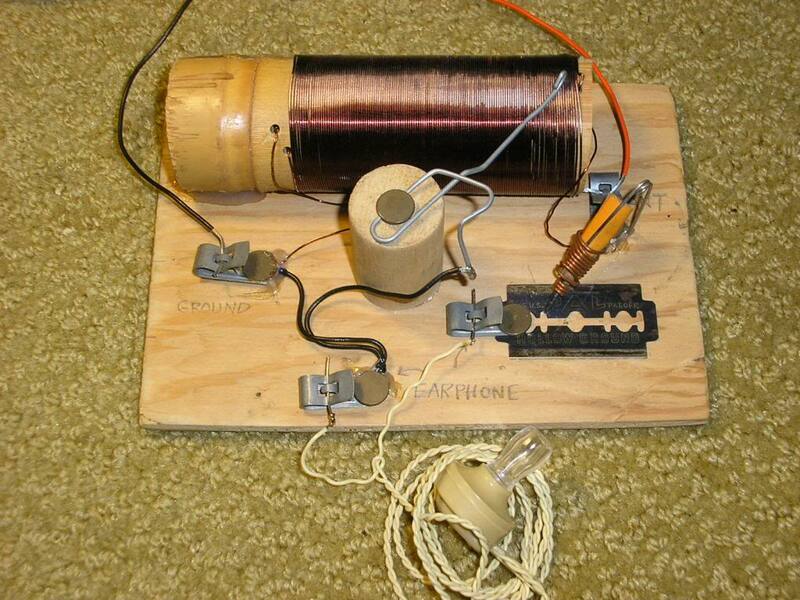 I built a crystal radio, too, but with standard-issue diodes and other components in the mid 1970s. It was a bit magic to think that the radio waves themselves provided enough power to drive that little earphone speaker. It was also fun to try different antenna configurations. Most of my youthful mechanical experimentation was devoted to unproductive purposes--mortars, adaptations of peaceful Estes rocket engines to power projectiles with small warheads, etc. Lots of fun, dangerous, and today would likely result in a jail sentence. Every try the Estes rockets HORIZONTALLY? Awesome ordinance! Was SO tempted to put them under my car chassis like James Bond. Oh, yes. And fired from the shoulder from a tube. But this definitely violates the Model Rocket Code's maximum of 30 degrees from vertical, and is dangerous. Oh, yes. And hired from the shoulder from a tube. But this definitely violates the Model Rocket Code's maximum of 30 degrees from vertical, and is dangerous. It was dangerous firing the thing veritcally!! Just looking at those things was dangerous. I melted my finger tips together one time playing with those igniter filaments! I'm still amazed that there is enough power floating in the air to drive a small earpiece speaker loud enough to hear, w/o any other power source. How many years before radio stations all go digital, and this is no longer possible? I guess you could hook up a pre-amp and CPU/DSP unit to decode the output of the crystal radio set, but that kinda takes the shine off it, don't it? I actually thought about that whole digital radio thing after the TV stations went digital. It used to be that you could detune a regular analog FM radio (spread the coils a bit, IIRC), and pick up some TV audio that was just outside the FM band. No longer possible. I also built that radio. When I was about 11 or 12 my parents gave me a subscription to the American Basic Science Club (American Basic Science Club: Story of a Successful Small Business - - Quick Reference) it was great fun but I don't think anyone would dare to do anything like that with our current lawsuit happy society. I also made a number of projects from The Boy Mechanic. I found a volume or maybe 2 volumes that had likely belonged to my Dad's older brother. It was with a bunch of adventure books, mostly published in the 2nd decade of the 20th century. I remember making some semaphore signals for my model rr. Took me a while to figure out that the wire shouldn't be stripped before wrapping it around the copper pipe. The adventiure novels were great too- the North Woods Boys, The Radio Boys, and many others I do not remember. My older son got interested in Estes rockets when he was 10 or so. We made a lot of them, and used to shoot them in the middle of a big pea field. Really nice times. Not an Estes rocket, but when I was in college we were at a party on warm night and firing bottle rockets from our third floor apartment across the parking lot toward the open window of one of our frat brother's third floor apartment on the other side of the parking lot where they were also having a party. Someone hit the open window and we watched people scatter!! Incoming!! It was stupid, and luckily no one got hurt. Back in the 1970s-80s (and still today, for all I know) USNA first-class midshipmen took a weapons engineering course that required building an Estes model rocket, launching it, observing a bunch of parameters, and analyzing the performance data. What that lab really did was place hundreds of model rockets (and explosives) in the hands of hundreds of midshipmen. I assembled one of those radios too, from a kit. The antenna was a long wire tied to something heavy (a rock?) and thrown over a tree branch in the back yard. More about remembering. I just realized that some of the members here are young enough to be my grandchildren, and most are about the same age as my own children. That being the case... Here are some subjects that may be surprising to you, and may be fun to discuss with your older relatives. I'm thinking of a particular period before many of the things we take for granted now, had either not been invented, or were not in general use. (If I mess up with some, let me know) Am listing this stuff to the best of my current memory. The time period is mostly between 1939 and 1945. Clothing- Cotton, Wool, Silk... no synthetics, until early 40's Rayon, Nylon etc. Music- 78 RPM records... no tape... recordings were on wire.... running between two spools. Imagine... 78 records in a car... (my aunt's car)... the needle skated all over the place. No air conditioning - anywhere... first A/C I remember was around 1944, in movie theaters. No dial phones... Number puleeze! Typewriters were manual... portables the new thing. And, How about this!!!! NO PLASTIC. Look around you and see what is NOT plastic. No Plexiglas... Cellophane for see through stuff, and Bakelite where we now use plastic. No such thing as blow molding which is so common now. Food packaging- cardboard, or cardboard cellophane, glass, or in cans... no aluminum cans then. Much of what we bought, grains, vegetables fruits etc were in bulk barrels or tubs. Latex paint... Nope... not until the late 40's. As I remember all colored "paint" was leaded... Even the baby crib rails that we kids chewed on. I don't recall stainless steel, at least not in household goods. During the war, trash was virtually non-existant. Threw nothing away... even leftover food... that went to pig farms. Our community's trash dump (about 1200 people) was about the size of what you could get into four or five Waste Management trucks... and it had been there forever. Amazing. We burned (outside wire burner) all flammable materials. Top half of car headlights painted black... Houses had blackout shades. Air raids... all electricity off... streetlights etc. A volunteer Air Raid Warden on every block, and spotters on the top of tall buildings. (Free pith Helmet and Raincoat). Airplane "spotter" cards... silhouettes for friendly and Japanese and German planes. In Fleer's bubble gum. Movies $.12 later amid outrage, went up to $.14. Chapter Pictures... Perils of Pauline, Tom Mix, Buck Rogers, Hopalong Cassidy, and later, Roy Rogers. First Technicolor film that I saw was Snow White..
We still said the Lord's Prayer in public school, and "Pledged" before the the Nation came "under God". Weekly $.10 savings stamps for eventual $18.75 bond. Knickers... yeah... I was the last kid in my school to wear knickers. Stretched out the "cuffs", and wore them very low, so they looked like the pants the rest of the kids wore. War posters on telephone poles, with ugly pics of Hirohito, Hitler, Mussolini etc. and "Remember Pearl Harbor" everywhere. Kate Smith. 60,000 US planes lost in WW2. B24 production alone was 650/month at it's peak, in 1944. Every street had at least one Gold star flag in the front window, representing a family member killed in the war. Many horse and wagons still plied the streets. Every memory triggers more... It's fun to recall how much has changed. and comparing what we have today, compared to what we had as kids. What was different, when you were five to ten years old? Never the engineer always the chemist, I always had the 120 piece chemistry lab going in my parents garage. Now Ms G is asking "What is that smell coming from the barn?" Growing up in the 50's and 60's things were much better than during the depression of the 30's and the war years that my parents lived thru. Many of the Dads including my own were veterens of WWII but nobody ever referred to them as heros. I found out when I was older that my Dad truly was a highly decorated combat war hero, wounded in battle, but he never talked about it and still doesn't until this day. Some memories are not so pleasant. I remember the air raid drills during the Cuban missle crisis, yeah, like hundering down in the hallway was going to made a difference in the event of a nuke attack. And, I remember in fifth grade when one of my friend's mom came to school and told everyone about the assination of JFK. That was probably the lowest point in my memory as a child. Then a few days later I was watching live TV as Oswald was shot. Of course I remember the 5 cent candy bars and 4 then 5 cent postage stamps. Growing up in the rural midwest I remember the frequent gas wars and the attendents filling the tank for you. The cheapest gas price I can remember was 19.9 cents/gallon. Often there were freebies at the gas station as well. There were the 19 cent fries and burgers at Bikes Burgers, that was the local version of a McDonalds. Back then McDonalds were not in small towns with under 10,000 population. Regal and S&H green stamps were doled out at the grocery stores. We helped our Mom fill up the stamp books because we knew that she would be using them to get us kids Christmas presents. In rural America TV reception was limited even with a big antenna. I remember we got to stations fairly good and 1 or 2 more that could be picked up on occasion but normally the picture was snowy. This was on a black and white TV. I remember the Saturday night line up was Lawrence Welk, which my sister and I hated but then it was Gunsmoke followed by Palladin. I remember the day that my Dad brought home our first color TB. All the kids in the neighborhood came over to our house to watch it. We had a drive-in that was popular entertainment in the summer. Mom would put us in our pajamas and pop up a big bag of popcorn and off to the drive-in we went. We would fall asleep and Dad wouldhave to carry us into the house when we got home. I remember going on vacation every summer. My Dad got 3 weeks vacation and we traveled the USA for 3 solid weeks pulling a travel trailer behind our big Buick. No A/C in our cars until the late 60's. Camping was always an adventure and you met the nicest people. I remember people feeding the bears in Yellowstone which is prohibited today. I remember the first can of soda I ever drank was when we visited my aunt and uncle in Las Vegas in 1959. The house we grew up in was very small by today's standards, only one bathroom and a small eat in kitchen. We had never heard of the term family room. No central air but we eventually got a window A/C unit in the late 60's. Kids played outside a lot, riding bikes and playing baseball in the summer and building snow forts and sledding in the winter. About the only electronics we had as kids was a small portable radio and a 45 record player. Oh, yeah I still have the Lionel train set that has to be over 50 years old. Race car tracks were also a real popular boy's toy in the early 60's. Halloween was really special back in my day. We weren't restricted to few hours to trick or treat. It was common to trick or treat the night before and the night of Halloween. Seldom did the parents go along unless it was with little kids. We went out with our friends and we would go out for 3 or 4 hours each night. We hauled in a full grocery sack or two full of treats. We would be on a sugar high for weeks after that. My Mom made her famous popcorn balls to hand out a Halloween. Kids and parents from all over town would stop by to get one of her softball sized popcorn balls. Now-a-days parents wouldn't allow their kids to eat anything that was hand made. School was a lot different, if you acted up you earned a trip to the principle's office for a paddling. You learned to stand up for yourself if you were bullied. I have a lot of fond memories of growing up at that time. How about green and yellow stamps given out by grocery stores and gas stations? Collect enough stamps and you could send away for stuff. Mom got me a guitar that way. I never did learn to play it though. I remember walking to/from school (no school bus). We even walked home for lunch. Had to cross a railroad track. We would leave a penny on the track on the way back to school and then try to find it after school (train would flatten it to the size of a quarter). In grade school we used fountain pens (no ball points yet). We would mix inks (making a huge mess) to make awesome colors that would freak the teachers out. We would go to the bank and get crisp dollar bills. Put a weight on them and then applied nail polish to the tops of them giving you a stack of bills you could peel a single off of. In the mid west during the sixties you were either a "baldy" (dry hair) or a "greaser" (greased back hair). Baldy was partial to madras and plaid. Baldy was partial to black and rolled up tee shirt sleeves. Bikes were our life blood getting us everywhere worth going. Not near as many cars in those days. We routinely played whiffle ball or touch football in the street. One of the great inventions was the transistor radio which allowed you to take your music with you outside. They were relatively expensive when they first came out. Banks would let you buy them at a discount if you opened an account. My mom got her good dishes from the bank also by making monthly deposits. I don't remember garbage pick up either. We burned most stuff or it went to the dump in the Saturday morning dump run with dad. I can't ever remember going out to eat. When the first McDonalds opened it was more popular as a hangout than a restaurant. Teens would back their cars in the parking lot and then there was an endless river of cars going through to see who was there. If you had a parking spot, you might spend the whole weekend night there. Growing up in Toronto, Canada in the 50s, I remember the iceman delivering huge blocks of ice to homes that still had iceboxes instead of refrigerators; and the home delivery of milk and bread done by carts being pulled by horses. We'd have the scissors man walking thru the neighborhoods, pulling a small wheeled stand, calling out to sharpen knives and scissors. We also had the popcorn man, pushing his small cart of freshly-popped popcorn (with melted butter, for 10 cents a small bag). We'd hear men calling out "Fresh Vegetables" as they drove thru the neighborhoods with fruits or vegetables for sale off the tailgate. We'd have occasional brownouts (lights dimming, etc.) as the electricity was 50 cycles. Switching it over to 60 cycles made a big improvement. My mom would save up grocery receipts to buy encyclopedias, dinnerware, etc. piecemeal at the grocery store. In grade 3+, for our cursive writing. we used straight pens with an inserted nib (sort of an evolution from the feather pens of colonial times LOL) and the built-in inkwells on the school desks . We had to use blotters over our fresh writing to speed the drying and keep it from smearing. Adults used fountain pens that they'd refill from a bottle of ink. Margarine was white. It came with an enclosed yellow dye pack, if you wanted to mix it in to make it look like butter. Banks were open very limited hours (hence the term "banker's hours"), and there were no ATMS, so you had to plan ahead to visit the bank where you'd interact with the teller for all your transactions. We used Canadian and U.S. coins interchangeably for purchases, although I'm not sure what the exchange rate was. My parents would let my sister and I ride the Toronto streetcars to piano lessons, church, etc. without adult supervision. At the time, my sister would've been 9-12 years old and I was age 7-10.